Fans gathered for a Peanuts-perfect photo at the Buena Park theme park. Fans gathered for a Peanuts-perfect photo on Sunday, Feb. 4. Walk into a stadium where a beloved sports team is about to take the field, and you'll encounter hundreds of jerseys and t-shirts in the stands, the sort of wearables that proudly boast the logo or mascot of the team. Saunter into a concert hall an hour before a huge band's big show, and you can bet you'll find bevies of enthusiastic fans rocking t-shirts and jackets recalling the group's past worldwide tours. 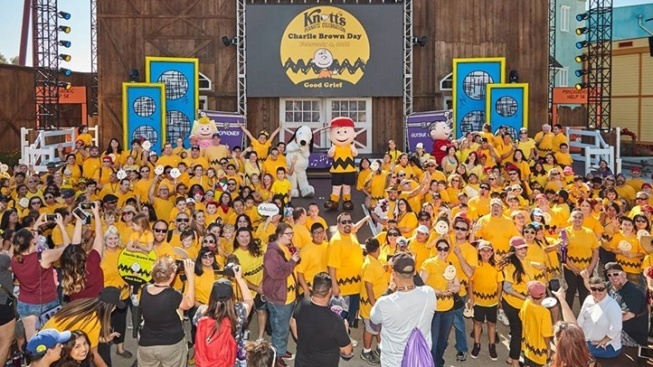 And if you happened upon Charlie Brown Day at Knott's Berry Farm, a theme park with a multi-decade penchant for celebrating everything Peanuts? For sure, you're going to come across a multitude of yellow shirts, the kind with the black zigzag across the middle. Which is exactly what happened on Sunday, Feb. 4 at the Buena Park destination, a place that's in the middle of its Knott's Peanuts Celebration run. Special Peanuts-themed events are taking place every weekend in February, but one of the most photographable of those events, and non-"aaugh"-able, happened on the first Sunday of February. That's when over 150 Charlie Browns grouped together for one mega Charlie-Brown-esque snapshot at the theme park's Calico Mine Stage. It's a notable number, yep, and "... a personal record for the park," stated a park representative. Small signs bearing a Charlie-Brown-ism — "aaugh!" — as well as placards bearing his iconic face were handed out to the crowd. And while the t-shirts ran the colorful gamut, from mustard to sunshine to deep yellow, they all rocked the essential mid-abdomen zigzag, making them very appropriate, indeed. Even if you missed Charlie Brown Day, there's still time to meet Pigpen, catch a Peanuts live show, and visit Beagle Bonanza by train at the park; get details on the Knott's Peanuts Celebration now.